Who doesn't like snacks? After a long day of writing, working on a script, untangling story knots, what do we do? We watch movies. Nothing like watching someone else's struggle with story problems to help one relax. Since we write comedy, what do we like to watch when we're free of the office for the day? Drama, Horror, Action, Thrillers almost anything but comedy. Don't get me wrong. I loved The Hangover as much as the next guy, but for free time viewing, I want to be kept on the edge of my seat. I also want snacks. I have a theory about snacks and movies. It's hard to eat while laughing. Laughing, the mouth is open and stuff can get in there, but if you keep laughing it's not going to go anywhere but on the floor. Ever heard of a spit take? In case you haven't. Snacks don't go with this. Snacks go with scaryhorrorthrilling. I've gone through my share of snacks in my day. I've been obsessed with a quite a few sweet/salty crunchy treats. There was a nasty little chiccarones habit. I used to come home from our office at the studio and gobble them by the fistful until finally they made me throw up. I was done with pork rinds. I quit cold turkey. I had a brief flirtation with French, burnt peanuts until for some reason "they" stopped making them. There was no name on the bag so I never knew who to write to. There was the salted sesame stick fling of two years ago, the toffee peanuts, and finally my chipping around with homemade kettle corn. These snacks as good as they were, always made me feel guilty, dirty if you will. Because I always felt I was doing something wrong, bad for me. Where oh where was the ultimate healthy treat? Something that I could feel good about. Something that I could take out of my hoodie pocket and introduce to Alan without shame. Something that I could give the proud answer to the question, "What are you eating in there????" "Nuuuffffing" (big swallow). I think I have found my dream snack. Kale chips! Yes, you read that correctly, kale. 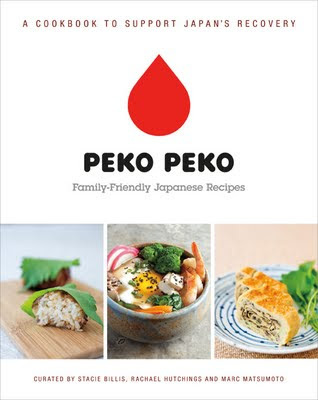 A couple of months ago, I bought the Peko Peko Cookbook which was put together by my friend La Fuji Mama and a group of fellow Food Bloggers in support of Japanese Earthquake Recovery. It took me a while to get around to trying some of the recipes in the book and the other day, I finally decided to give it a try. I flipped open the book to Kale Chips. Hmm I thought, could this be a tasty crunchy snack that could actually be good for me? There was only one way to find out. Try making them. Now kale chips in a bag at the market cost about 7.99. I am too cheap to go down that path. I figured homemade is the best way to go. I found some amazing organic kale at the Farmers Market for 1.99. I was already ahead of the bargain. The rest was easy, easy easy. Rinse, dry and tear the kale into bite size pieces. For the rest, you need 3 simple ingredients. Put the shredded kale into the bowl of dressing and mix it around well. Put the pieces of kale onto a parchment paper covered cookie sheet. Make sure the leaves are not piled on top of each other. Put them into a preheated 350 degree oven for 15 minutes until they're nice and crispy (You may need to bake the kale in three or four shifts so the leaves don't get overcrowded) and then enjoy. It's that fast, and that good! I'm going to be trying some of the other Peko Peko recipes soon, but for now my new main squeeze are these crispy baked kale chips. I love kale chips. ONLY reason why I grow kale. First time I made it, it was too better. May fault. Harvested leaves too mature. Love the @fujimama's take on this! Thanks for sharing, Kathy! Kathy, I agree: Kale chips are definitely a great healthy movie snack. Simple, healthful, and remarkably scrumptious! Hi Kathy! Yes.... snacks and movies do go hand in hand! Thanks for the heads up on the recipe book - I love that bloggers have done so much in support of Japan - love kale chips - delicious! Can't watch without eating! Love kale chips and this version deserves a movie-marathon. I am a big fan of kale chips but never during the movies. I am popcorn kind of gal through and through. Kathy, Just came back from the market and put in my bag beautiful green and purple kale, was absolutely stunning, only to put it back cause' it was not organic. Though I am not 100% purist and but organic when available. Definitely will look for organic to try these chips. I just found this this morning - I've been making my own variation from Cathy Elton's for about a year, but this one is going to be the next! I use a lot of Asian ingredients in my cooking anyway, but I never thought of this particular combo. I've already directed some friends to this page and linked on the Fiddleheads Food Co-op (where I get my organic lacinato in New London, CT) Facebook page. I love the step-by-step instructions and photos, so helpful. FYI for anyone who hasn't tried it before: DON'T substitute curly kale for the lacinato, the ruffled edges fell apart before I could get them on the baking tray.